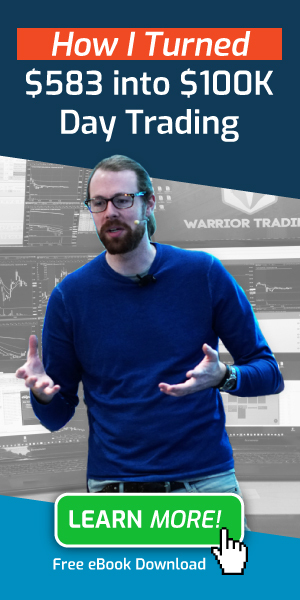 Edwin joined Warrior Trading as a student in February of 2015 and quickly began learning the strategies and techniques that we use everyday to trade the markets. While I’m a high-speed trader focusing on quick momentum breakouts, Edwin prefers a strategy that is a bit slower. He trades momentum and reversals, but focuses on the 5min time frame and rarely trades during the opening range. During 2015 Edwin participated in our Mentor Program, attending one-on-one sessions to help improve his trading in areas where he was struggling. We create a unique trading plan and a set of goals for each of our mentor students. This was no different with Edwin. Although we encourage beginner traders to use a paper trading account, by the time Edwin joined Warrior Trading he was already using a live trading account at Suretrader with good success. The goal for Edwin was to improve his statistics so he could be a more profitable trader. This mean increasing his accuracy and increasing his profit loss ratio. Between January of 2015 and October of 2015, Edwin turned a $5k Suretrader account into over $76k, for an impressive 1560% return. Each of these trades were verified in his Profit.ly Profile. As of today, July 21st 2016, Edwin has turned his original $5k into nearly $200k in trading profits. 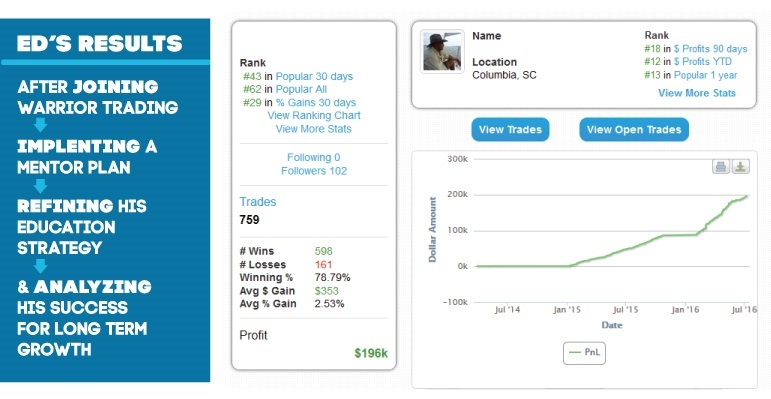 He has greatly improved his profit loss ratios, and now trades with an overall percentage of success of 78%. He has already achieved a level of success that he can be extremely proud of. As you may know, we recently conducted a survey of over 2000 students and we found that the biggest struggle traders are facing is consistency. Traders felt lack of consistency was the biggest obstacle to success as a day trader. This is actually something I’m very familiar with! As a beginner trader I also struggled with accuracy an consistency. I would have several great weeks, then several horrible weeks. I had a hard time understanding why I was doing well, or why I was doing badly. The trick is to start tracking your trades so you can begin to understand your patterns! Edwin is religious about tracking his trades an maintaining detailed trading logs. These logs allow him to sort through his winners and losers, and draw conclusions about the results. By understanding your leading cause of inconsistency, you stand a much great change at correcting those issues and finding success. In my years of working with students I’ve found the leading cause of failure is a lack of risk management, and over trading. The best students trade only 2-4 times/day, making their daily goal quickly then getting back out of the market. Many students think you need to trade 15-20 times a day to make good money but it’s not true! To prove this, in June of 2016 I did a challenge where I used the strategies we teach (Momentum) to trade just 2hrs a day. I took a total of 88 trades over the course of 22 days. That’s exactly 4 trades per day on average. I made an average of $826 on my winning trades and lost $580 on my losers. This gave me a 1.4:1 profit loss ratio. I traded with just under 70% accuracy. In total, I made over $34k. This is a great example of the potential rewards of the Momentum Trading Strategy. While you may trade a different strategy, you still need to have similarly strong metrics in order to be profitable. This is something all successful traders have in common. In order to get there, you need to adopt a well defined trading plan. All of our students who work with us as mentor students or students of the Day Trading Course are given a trading plan. We require that while they are trading they track all of their trades in an excel doc so we can understand their behavior and start to recognize their trading habits. As an instructor, I spend many hours a day reviewing the trade logs of our students. I’ve become so familiar with these statistics I know exactly what students need to do to improve their results. The challenge of course is that the student needs to implement these changes, and sometimes it’s easier said than done! Fortunately, we are happy to work with our students during our 3x weekly mentor sessions and our 1-on-1 sessions to give them the extra support they need. 4 Trades Per Day based on the strategy that the student and mentor have developed together (Momentum, Gap and Go, Reversals, etc). Profit Loss Ratio target, 2:1, min is 1:1. Students trade for in the simulator until they achieve these statistics, then they graduate to real money. Do you need Rolex’s and Fast Cars to be a Success? The dream of driving Lamborghini’s, wearing a Rolex, and living the high life brings many traders to the market. It’s the dream of becoming a millionaire. The truth is, I don’t believe this is the level of success most of our students are looking for. While young men often dream of making millions overnight, our students are typically a bit older and rather than looking to get rich, they have set their sights on more practical goals. For example, Ed has been able to retire from his 9-5 job as a teacher. This for him marks success. He can now spend more time with his family, work from home, and he loves the life he’s living. They say you should spend your life doing what you love. Unfortunately most of us don’t know what that is, or we don’t know how to make a living doing it. For traders, the market becomes our passion. Like Ed, I love trading, and I spend my entire day focused on day trading, working with our students, and maintaining our trading courses. As you have probably already realized, we don’t teach a strategy that will make you a millionaire overnight. However, the strategies we do teach have been used by thousands of students, like Ed, to make a living from the market. As of this year Ed is already up over $100k in just 6 months! He’s on track to double his gains from 2015. Think about how long it takes for most people to make $100k. If you are making $100k/year, you are in the top 4%. That is something that is easily obtainable for a successful trader. Here’s the problem, only 1 in 10 will be successful! 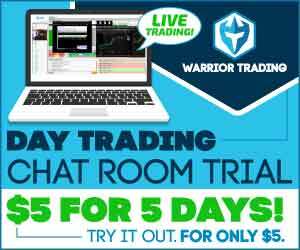 What does Warrior Trading do that’s different? We provide training that has been proven to be successful for our students. We conducted a survey and found that over 80% of our students are trading profitably since finishing the classes. This is the level of success we aim for. If some of our students are able to realize gains of $200k, $300k, or even more, it will likely be the result of exceptional discipline and aggressive risk management. If you are ready to take the leap and start your journey as a Day Trader, we’d love to have you join us. Ed, I’m so happy for you and your achievements. Well diserved and so hunble. Thanks for all the help you do with in and out of chat. I remember the first time I saw Ed’s interview, I was impressed by his humbleness and strategy of “sticking to what you know”. Since then I’ve been a trader with the chat room and I’ve learned tremendously about managing risks and making profits. It would be of a great value if we have another interview with Ed about his current place in the path of success. I’m happy Ed is doing so well. Like other “aspirants” I watched Eds first interview and was inspired and impressed with his humility. Though I took the Day Trading course and opened an account with Suretrader I didn’t do so well…like Ed the “speed of things” was a little too much for me. I have had a couple of “blow ups” since then…one big, big one…but I shall try again. So great to hear more about Ed ! Congratulations & Bravo … Would love to see an update interview/ As a ballet dancer about to begin I know that repetition / education & technique are the mothers of Skill & look forward to the future with the Warrior Trading community !